McIlroy coy on Tokyo Olympics: "Four years' time is a long ways away"
Tournament prelims are not well known for providing deep insights but Rory McIlroy's chat ahead of the WGC-HSBC Champions in China was full of nuggets. If you believe he skipped The Olympics because of more than Zika, he hinted that you may be right. Was disgraced OCI president Pat Hickey a factor? Or was the age old nationality issue the problem? We'll have to continue reading between the lines, it appears. Q. So when you were up top waiting, you probably saw the Silver Medal, the Olympic Silver Medal from Henrik, and also we’re not sure if during The Ryder Cup Justin had showed you the Gold Medal, but would that be a sting for you, as well, for not participating in the 2016 Rio Olympics and for the upcoming 2020 in Tokyo, would you have any plans to go in and participate in that Olympics? RORY McILROY: Tough questions. Does it sting? I think it doesn't -- when I see players or peers achieve something that I haven't achieved, yes, of course that stings a little bit. But the participation in the Olympics for me, it's just a little more complicated I feel for me than some other people from where I'm from and the whole politics of the thing. It's a difficult subject for me. 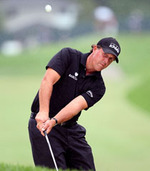 But I thought if anything, I was really happy with how golf went in the Olympics. I turned it on in the final afternoon and to see how many people were out following and the atmosphere of it I guess, you could sense an atmosphere in the crowd. It was fantastic for golf, and to have two of our best players in the world battling it out for a Gold Medal, it was great for the game. It really was. I was really happy with how it went. I was delighted of how well it went and honestly, I was happy to be watching on TV. I was happy for those guys. I was happy it was going so well. Four years' time is a long ways away, so we'll see what happens. Right now, I'll concentrate on the 16 majors that we have between now and then and try to get a few more of those and go from there. Q. I understand the International Golf Federation next month announced the conditions of eligibility of the Olympics for 2016. Are you any closer to or have you actually made your mind up on who you are going to play for at the Olympics? RORY McILROY: Yeah, actually I've been thinking about it a lot. I don't know whether it's been because the World Cup has been in Brazil and I've been thinking a couple of years down the line. Thinking about all the times that I played as an amateur for Ireland and as a boy and everything; I think for me it's the right decision to play for Ireland, so I'm going to play for Ireland in 2016, and yeah, it's something that I have been thinking about for a while. I feel like it's the right decision for me (applause). It's more just because now that I'm playing golf for money and I'm a professional, I'm supposed to have this choice or this decision to make where, you know, if you look at the rugby players, you look at cricketers or hockey players, their sports are viewed‑‑ they view Ireland as one, the same as we do in golf. I don't think there's any point to change that or any point to go against that just because it's a different event or it's the Olympics. I was always very proud to put on the Irish uniform and play as an amateur and as a boy, and I would be very proud to do it again. RORY McILROY: More worried about what other people would think, rather than me. But you've got to do what's right for yourself and what you feel most comfortable with, and ultimately that was the decision that I made. Q. In terms of the timing of that decision, is it a conscious thing to get it out of the way and just get it done with? RORY McILROY: I think so. There's no point in delaying it and letting it linger any longer. And as I said, watching the World Cup in Brazil, thinking about Brazil in a couple of years' time, it just sort of got me thinking, maybe I should just go ahead and get it out of the way, and really look forward now to the Olympics in a couple years' time. Q. Obviously a good week to make such an announcement. Did you go and ask anyone's advice? RORY McILROY: No, it was just something that I've had a lot of time on my own by myself the last few weeks and just sort of been thinking about it a lot. It's something that's been quite important to me and something that I needed to make some sort of decision or some sort of stand on it. Just weighing up everything, and thinking back about the times that I played for Ireland and won The European Team championship with Ireland, won a lot of great amateur titles representing Ireland, I just thought, why change that. Basically it's just a continuation of what I've always done. McIlroy has not represented Ireland at any level since 2011 and by skipping the World Cup in Australia from November 24-27, preferring to play Dustin Johnson in an exhibition (with a charity element) in the Philippines on November 29, he may technically be able to represent Team GB in 2020. Peter Dawson did his best to take the choice away from McIlroy in 2013 by referring to the Olympic Charter, which states that he must play for a certain country if he has represented that country in continental or regional games or in world or regional championships recognised by the relevant IF". "I would very much like to take this burden of choice away from the player if we can possibly find a way because it's not fair," Dawson said in his capacity as Chairman of the IGF. "The last thing we want is the player to worry about it." iven that five years have passed since McIlroy and Graeme McDowell played for Ireland in the World Cup, the nationality clause may be on the table again. McIlroy skipped the 2013 World Cup, which took place two years and eight months before the Rio Olympics and is skipping it again this year. This is the second attempt at a head-to-head exhibition for McIlroy this year. He was planning to play Rickie Fowler in Detroit this summer until a deal with sponsors fell through. This one was set up on Nov. 29 with Day, the No. 1 player in the world whose mother is from the Philippines and who had family members perish in the 2013 typhoon. Sean O’Flaherty, who manages McIlroy, said the event would include a gala dinner and an auction on Nov. 28, which features bidding to be caddies for Johnson and McIlroy over nine holes, along with other memorabilia. He said proceeds would go mainly toward relief efforts from typhoons. Johnson is giving up a place in Tiger Woods’ Hero World Challenge in the Bahamas to compete, which is either a huge charitable gesture or he’s also getting paid a huge appearance fee to play McIlroy. Local media have speculated that they participants will get $1m each. As for the rest of his presser, he confirmed that he'll try some Taylormade equipment and will try to win the event to close the gap on Danny Willett and Henrik Stenson at the top of the Race to Dubai. He also confirmed that he gave JP Fitzgerald a $1.05m bonus — 10 percent — as a reward for winning the Tour Championship and the FedEx Cup. Rory on Trump decision: "You respect the office, even if you don’t respect the guy that is in it"
Rory McIlroy is hoping for a “special” week after being paired with Phil Mickelson and US PGA champion YE Yang for the $7m WGC-HSBC Champions in Shanghai. Phil MickelsonThe 20-year-old Holywood starlet avoided Tiger Woods as the world No 1 was drawn with Volvo World Match Play winner Ross Fisher and Thailand's Thongchai Jaidee for Asia’s first World Golf Championship. Hoping to close the gap on Lee Westwood and Martin Kaymer in the Race to Dubai, McIlroy said: “I’m playing with Phil Mickelson and Yon-eun Yang so that’ll be really good. 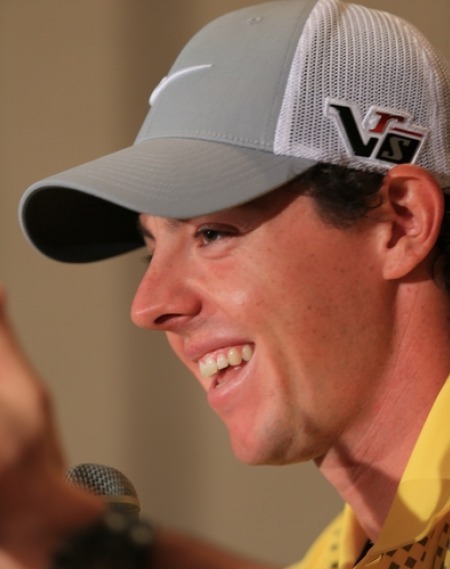 Rory McIlroy breaks into laughter during Wednesday’s media conference at Doral. Picture: Fran Caffrey / www.golffile.ieRory McIlroy never claimed to be the paradigm of virtue or the poster boy of perfection that his blue chip sponsors would love him to be.